Notice: Any copying or downloading of photos or content without prior written permission is forbidden by law. This page is a collaborative effort for the sole purpose of sharing biosecurity information to help protect all birds from Exotic Newcastle Disease. All content of this page Copyright© 2003, Cocka2.com and BeakStreet.com. All photos Copyright© 2003, BeakStreet.com, with exclusive rights of use by Cocka2.com. Linking to this page is encouraged and appreciated. Thank you. Virkon S® mixed at 1.3 oz. powder per gallon of water. Nolvasan® (chlorhexidine diacetate 2%) mixed at 3 fluid oz. per gallon of water. 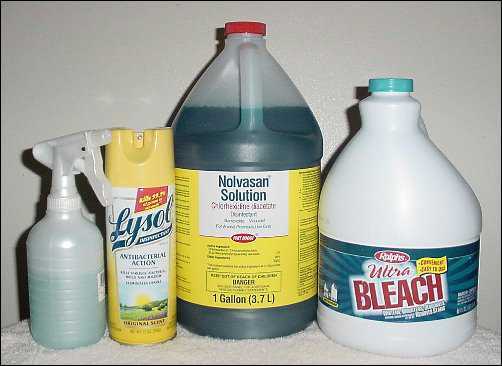 Household bleach (sodium hypochlorite 6%) mixed at ¾ cup per gallon of water. Internet sources with pricing for Nolvasan and Virkon S are provided at this link. Carry a plastic spray bottle filled with disinfectant solution in your car. (Household bleach diluted with water, or Nolvasan prepared as directed, also works nicely as it can be sprayed on your skin, hair, shoes, clothing and does not stain unless water does.) Spray on bottom of shoes and hands each time before entering your vehicle, your home, or any premises where birds are kept. TIP - Walgreens has small spray bottles that are small enough to be placed in a leather waist pouch or perhaps a purse. Plastic spray bottles (normal size) can be found at Smart & Final, Home Depot, Sam's Club and many other stores. Fill your bottles with a Nolvasan solution and carry it with you. 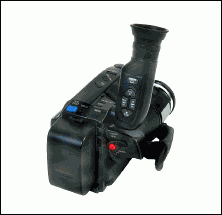 Some spray bottles easily fit in the side pockets of a van or car. TIP - Carrying a toilet brush in your vehicle works well for scrubbing off dirt and debris from the bottom of shoes before spraying with disinfectant. Once you have used the brush on your shoes, be sure to spray it thoroughly with disinfectant before placing back into vehicle. Before bringing new purchases into the home, particularly bird supplies, etc., spray the outside of the box, bag, or container with disinfectant solution. Allow to dry, preferably in the sun. The END virus can survive for several weeks in a warm and humid environment on birds' feathers, manure, and other materials. It can survive indefinitely in frozen material. However, the virus is destroyed rapidly by dehydration and by the ultraviolet rays in sunlight. TIP - Try to patronize only merchants who have biosecurity in place (LINK). Take your own clean boxes with you to the bird supply store and leave them in your vehicle until you are finished shopping. Go to your vehicle, spray your hands and then take them and your spray bottle of disinfectant with you to check out. Spray the check out counter then place your boxes there. As each item is rung up, spray it well first then place in your own boxes. When you get home, place your boxes in the sun to dry well and allow the UV rays to further disinfect. We suggest only Nolvasan for spraying anything that birds will be in direct contact with (like toys) since other disinfectants must be rinsed off first. Hand Sanitizers - Keep waterless hand sanitizer dispensers near each entrance to your home. Anyone entering the home, including visitors, should spray their hands with a Nolvasan mixture or use one of the hand sanitizing products. The individual packets are handy to keep in your vehicle and also carry in pocket or purse to use when grocery shopping--wiping down the basket handles and such. Also use the hand sanitizer packet when re-entering your car. Wipes can be used on your hands, door handle, and steering wheel. While sitting down with your feet outside the door, spray the bottoms of your shoes well with either Lysol or Nolvasan solution. TIP - Smart & Final carries antibacterial hand sanitizer products that can be purchased in large quantities at a reasonable price. Footbaths - Place a footbath at each entrance to your home, which every person entering your home is required to use. 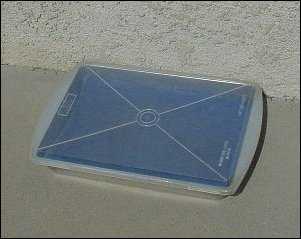 What works well for light traffic areas is to use a shallow plastic Tupperware-type pan with lid or an aluminum 9 in. x 13 in. cake pan with a plastic lid as the container. Place a towel or 3 to 4 wash cloths on the bottom, then cover with a disinfectant solution of Nolvasan or Virkon S and water. Be sure your footbath is clean and free of debris and always filled. Depending on what disinfectant you use, it may break down more quickly so be sure to change it frequently. TIP - Keep a toilet brush by your footbath for scrubbing off dirt and debris from bottom of shoes before using the footbath. Once you have used the brush on your shoes, be sure to spray it thoroughly with disinfectant. For a larger footbath container, a shallow bus box from Smart & Final works nicely. Lining the bottom of the bus box with a synthetic grass door mat cut in half (available at Home Depot) fits perfectly. 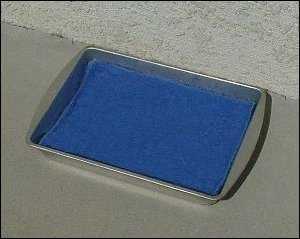 TIP - Thin absorbent pads (as pictured above) are available at Smart & Final and work well as you step out of the footbath. Other Pets & Biosecurity - Keep your cat(s) indoors at all times. Before your dog(s) enters your house, spray all four feet with a Nolvasan mixture. Wiping the feet well with a Nolvasan soaked washcloth will help remove any debris. When used in the proper dilution, Nolvasan will not harm the dog. We do not recommend using any other disinfectant on your dog's feet. If you are using Nolvasan in your footbath, made according to directions, it will not be harmful to any critter unless they ingest a very large quantity. Biosecurity for Persons Using Wheelchairs - Nearly all chairs have a separate rail attached to the wheel to use in propelling the chair. Many people rest their hands on the wheels themselves when not moving. It's important to use hand sanitizers (ala Purell) to clean one's hands prior to other biosecurity or handling anything else for that matter. Not doing that will cross-contaminate everything touched, especially if there is gook on one's hands from the wheels. As for the wheelchair itself, the most serious problem is the tread, and like tires on cars, the tread can pick up some debris and possibly END. We recommend that you wipe off the tires well before loading it back into your vehicle using either a rag or washcloth sprayed well with Nolvasan. You might also try one of those scotch rite pads or a toilet brush to rub them first and then spray them with a garden sprayer filled with disinfectant. Remember to disinfect your scrubbing medium before placing it in your vehicle. If you have out been of the house with several stops to make, it would be very burdensome to keep disinfecting your chair. When you get home and unload your chair, do a really good job of disinfecting before you take it in the house by disinfecting the tires well as above. However, it does take about 10 minutes to kill the virus so you need to wait a bit before entering. Next, spray very thoroughly inside your vehicle where the chair had been placed. While wheelchairs don't have fenders, each chair is often sprayed if one goes through a puddle or mud. The spray areas on the chair will require some extra attention. Each chair is different, and most people are familiar with the cleaning characteristics of their own chair. While there are other CDFA listed disinfectants, we have used Nolvasan in our example as it will not stain unless water will. Biosecurity for Persons Using Crutches - For those using crutches, on entering your vehicle, remember to spray the bottom of each crutch well along with your "stepping foot." If you cannot step into a footbath due to instability, place a chair outside by your footbath so that you may sit down first and then place the "stepping foot" into the footbath. Again, place both crutches in the footbath also. Place "No Trespassing" signs on gates and at the entrance to your property. 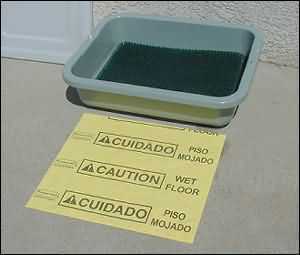 Post a sign stating that you are practicing biosecurity on your premises. 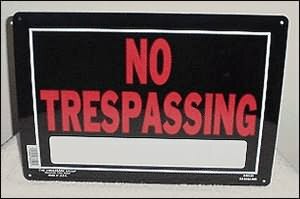 TIP - A variety of "No Trespassing" signs can be purchased at Home Depot at very reasonable prices. 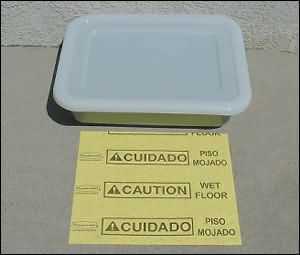 If you wish to print one of the pre-made biosecurity signs, which can then be placed in a laminated sheet, please make a selection in Microsoft Word format or PDF format. 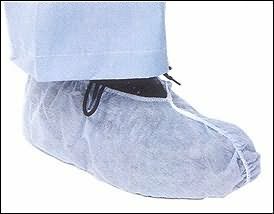 If it is necessary for workmen/servicemen to enter your home, and they cannot remove their shoes/boots or protective clothing due to OSHA concerns, have disposable shoe covers (AllHeart.com, pictured) and coveralls available for them to put on before entering premises. It is recommended that one keep a video camera with batteries fully charged near your front entrance -- ready and waiting to record any Task Force activity on your premises. Be SURE to ask for identification of each person! TIP - Many of the tips and information about purchasing disinfectants, etc., were compiled from the Cocka2.com "Frequently Asked Questions" section. To learn other important information regarding quarantine, appeals process, risk assessment and much more, please visit the END FAQ's. Jim Adlhoch, who has been devoting a lot of his time to giving presentations about END biosecurity in Southern California, has created a very helpful END Biosecurity Resources website, including links to vendors he has used. Thank you, Jim! Disclaimer: Brand names, stores/establishments, and photographs used on this website are provided as examples only and do not constitute a guarantee, warranty or endorsement by Cocka2.com. These procedures are not guaranteed to prevent the highly contagious exotic Newcastle virus from affecting your birds. However, they will reduce the risks and may also help your case if you need to appeal a premise quarantine or request a Risk Assessment to save your pet birds from depopulation. Copyright© 2003, Cocka2.com and BeakStreet.com. All Rights Reserved.